I say this quite a lot, but this year has flown by! Seriously, how are we in October already?! If you're a regular reader of my blog or follow us on Instagram or Facebook, you will know how much I love shopping.. especially at Next! I'm always picking up something from there. It's definitely one of my favourite shops, for both clothes and home decor items. So with the weather getting a lot colder recently, I ordered some bits for Sophie online as she needed some warmer outfits to last her through Autumn/Winter. She's grown so much recently and because she's so tall for her age, I ordered all of these items in 3-4 years so they will hopefully last until next year too. 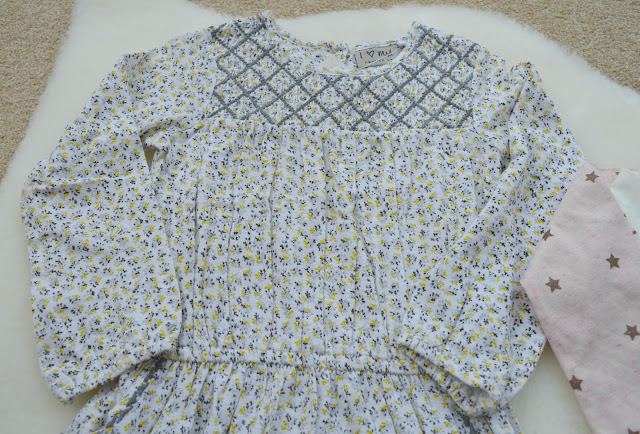 I've been waiting for items to arrive over the past few weeks, and now that everything is finally here, I thought I'd do a little haul for those of you who like reading this kind of post. 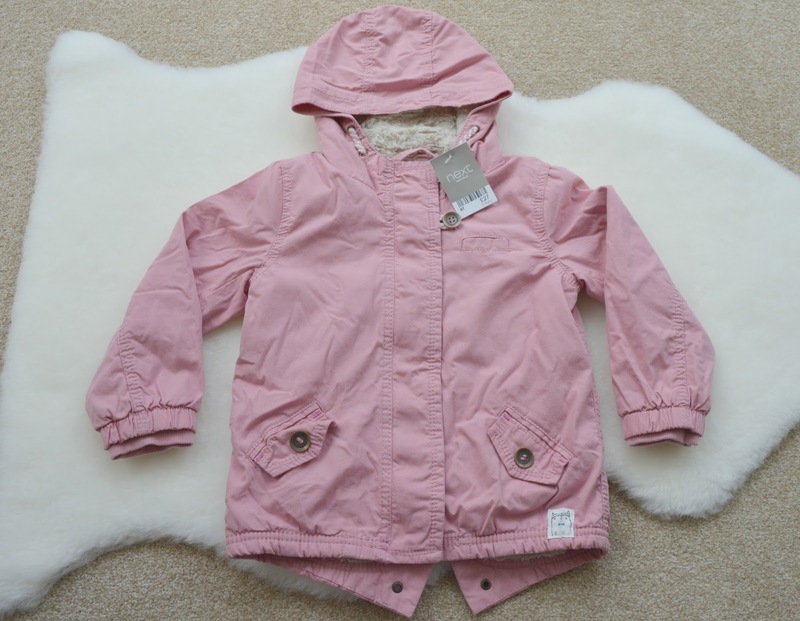 I firstly ordered this pink parka jacket, as her winter coat from last year no longer fits her. It has a really soft, faux fur lining (which you can see it in the hood) and the jacket itself is a lovely shade of pink. This ditsy print smock dress isn't something I would usually go for, but I was somehow drawn to it and think it will look lovely paired with tights, boots and a cardigan. I really like the detail at the top and the long sleeves. I also picked up this three pack of t-shirts, as Sophie doesn't have many long sleeve t-shirts and they're essential for Winter and will go with jeans or leggings. Again, Sophie didn't have many jumpers or cardigans either. 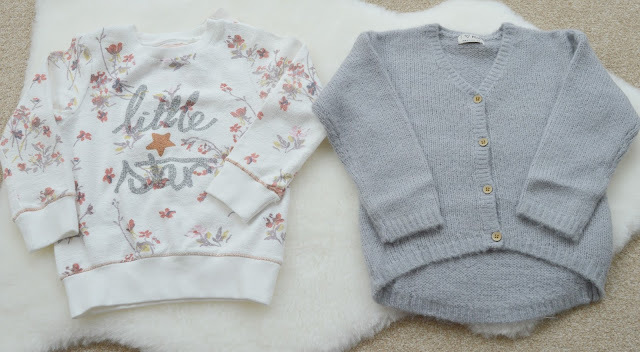 I really like the little star jumper on the left and this fluffy cardigan will go with pretty much everything. I'm loving the colour grey at the moment! We recently got Sophie's feet measured and she's a size 8F which seems rather big in my opinion! She's not even two and half yet, but she is pretty tall for her age and she's always had big feet haha! I love these ugg style suede boots which will keep her feet warm and I know she will get a lot of wear out of them. They're a size 9, as I wanted them to last throughout Winter too, she's been going through shoes so quickly as her feet keep growing haha. I also thought I'd show you a few of the bits I picked up a while ago too, although Sophie has worn them. I love this cream cable knit jumper and it looks lovely with jeggings and boots. The pink ditsy print dress is beautiful and I think it really suits her. It also comes with a pair of footless tights too. Lastly, there's this star tunic which I think is a great price and I love the little bow detail on the front. That's it for this haul but I hope you've enjoyed reading this post. 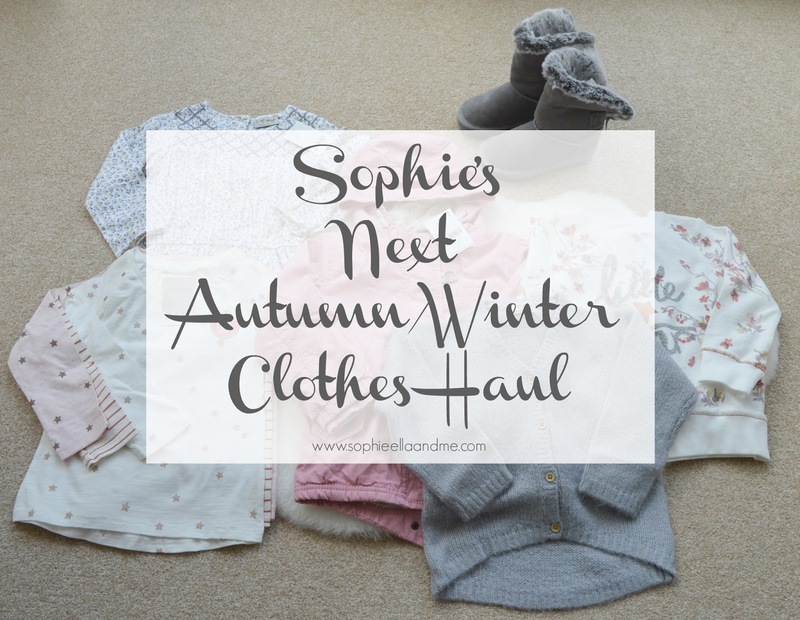 I'd love to see outfits you've bought for your little ones for Autumn/Winter too! Ohhhh those booties are just adorable. Gorgeous clothes too!